Toni Nagy spends her time distracted on the Internet, making content for the Internet to distract people with. She is a writer, filmaker, podcaster, dancer, yogi, and private yoga instructor. Favorite yoga pose: No-armed handstand where I simply levitate upside down. Yoga is…transformative when you integrate the philosophy into your everyday way of being. There's a certain comfort to my yoga practice because it is not only familiar, but it also grounds me—like a homing pigeon bringing me back to myself. The poses have become so commonplace that they allow for space inside my head and body to feel fully. Yoga also led me to a meditation practice, which has drastically impacted my life. Even though most of the time I am talking incessantly to myself about important things like what I'm going to eat for breakfast, the daily commitment of meditating keeps me semi-sane. Considering all my clothes are super sweaty, I should probably add that since I am into yoga, I only use all-natural/organic products—so my deodorant is just a stick of positive intentions. My shirts are pretty smelly, and people have had to get used to that. I have a 4-year-old child, and the teachings of yoga have been incredibly helpful during this parenting journey. It has inspired patience in times when my daughter takes 25 minutes to find the right pair of tights that are pink, but not too pink or itchy, and they have to be warm, but not too sweaty or small, but they can’t be too floppy either. 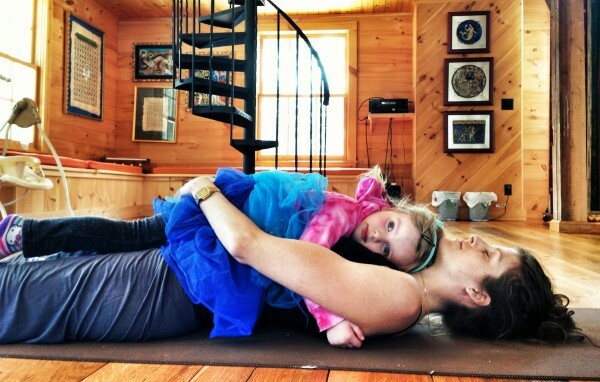 Since becoming a parent, most of my yoga is a self-practice at home. My daughter is usually with me while I yoga, and I have done my best to condition her like a coach of Russian gymnasts-to-be in line. There are many days where she will play on her own and give me space to get in the flow, then other times when she can be a little distracting. Say when I am in a bound half-moon and she gets right up in my face to ask me to make her a sandwich with avocado, pesto, ice cream, and mayonnaise. Or if I am in headstand and she comes and tickles my tummy. Not to be corny or obvious, but “The Power of Now” really moved me and genuinely changed my life. It reinforced how vastly important it is to be content in the moment, and that obsessing about the past or future is not only futile, but can also create a personal psychological hell. My daughter and I sometimes battle over music. I prefer my Pandora “Silent Ganges” or “Wah” station, but she insists on Katy Perry or Ariana Grande. We both agree on Sia, so that is a decent compromise. When I am feeling tired and cranky, my go-to is hip hop, or Belly Dance music. I am a dancer so I really enjoy playing music to almost every activity of my life, but if I practice outside, I will listen to the sounds of nature. “You have to be strong to get strong.” I even wrote about it here!